Teddy needs you to be his voice! This poor animal was found starving, chained, his collar embedded into his infected neck, and his head was swollen to twice or three times a normal size. The B.C. SPCA called his abuse and torture "profoundly shocking." Teddy died two days after authorities seized him from his cruel owners. 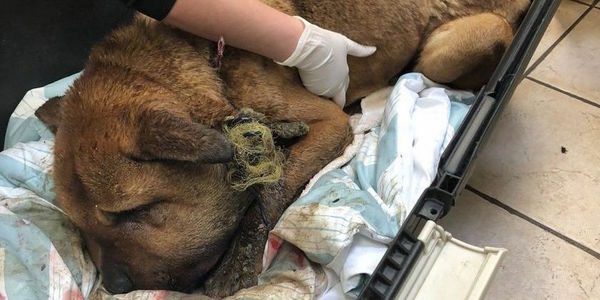 We are petitioning Crown Council and MLA Doug Routley to ask that the maximum penalty be imposed on Anderson Joe and Melissa Tooshley for their horrific act of animal abuse. If convicted, Joe and Tooshley face a maximum penalty of up to five years in prison, a $10,000 fine and up to a lifetime ban on owning animals. Please read Teddy's story and help us reach as many people as possible by signing and sharing this petition. Article written by Cowichan Valley Citizen. "This is one of the most profoundly shocking and disturbing cases of abuse we have ever witnessed," said Marcie Moriarty, chief prevention and enforcement officer for the BC SPCA. "We received a report of a dog in distress and when the constables arrived at the property they found a medium-sized brown dog on a tether that was only a few inches long, standing in a large pile of mud and feces." "As they got closer there was an overpowering stench and they realized that, not only was the dog severely emaciated, but his collar was deeply embedded into his neck, causing massive infection," she said. Moriarty adds that the dog's head was swollen to two to three times its normal size. "The constables used bolt cutters to free the dog and immediately rushed him to an emergency veterinary clinic," says Moriarty. "The wound from the embedded collar exposed the dog's trachea and jugular vein — it was horrific." Despite extensive emergency treatment and around-the-clock care, the dog succumbed to his critical condition two days later, the SPCA reported. "This kind of appalling neglect and cruelty is sickening and absolutely unacceptable in our society," says Moriarty. We strongly urge you to write to Justice Minister Wilson-Raybould and call for immediate action on updating the animal cruelty and abuse lesiglation in Canada.